Debating this high-end option for your kitchen or bathroom? Find out what all the excitement’s about! In the world of contemporary kitchen and bathroom design, few aesthetic innovations have stirred as much interest as the waterfall countertop. 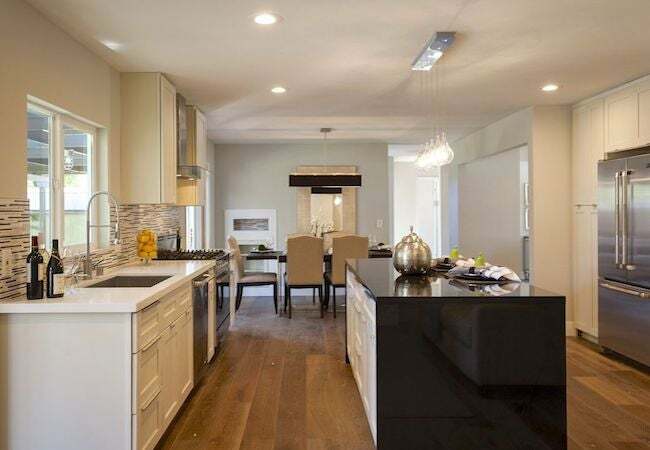 Whereas a traditional countertop has a single horizontal surface that ends at the edge of an island, peninsula, or bank of cabinets, the waterfall drops vertically down the sides, creating a continuous flow of all the way to the floor. It’s all about looks, a way to put a dramatic material—usually natural stone—on display, and as you’d expect, it’s pricey! So read on for details about all the options to see if this splurge is right for your remodel. As kitchens become gathering places and bathrooms feel increasingly like personal spas, our most functional, practical rooms are trending towards greater sophistication. No wonder the waterfall has caught on! In a cookspace, a waterfall countertop can be a stunning focal point, linking floor design with cabinetry in one dynamic sweep and elevating an ordinary island to the level of fancy furniture. Though it would have no place in a traditional home, a waterfall countertop offers the strong, clean lines key to a contemporary kitchen. In the bath, a smoothly flowing expanse of stone on the sides of a vanity can seamlessly connect to walls or flooring. And since natural stone is waterproof and moisture-proof, it’s a perfect choice for a steamy bathroom. While a waterfall countertop might be called upon to camouflage a set of barstools or hide an appliance, its main purpose is appearance, and so it’s usually crafted from beautiful, quality materials. 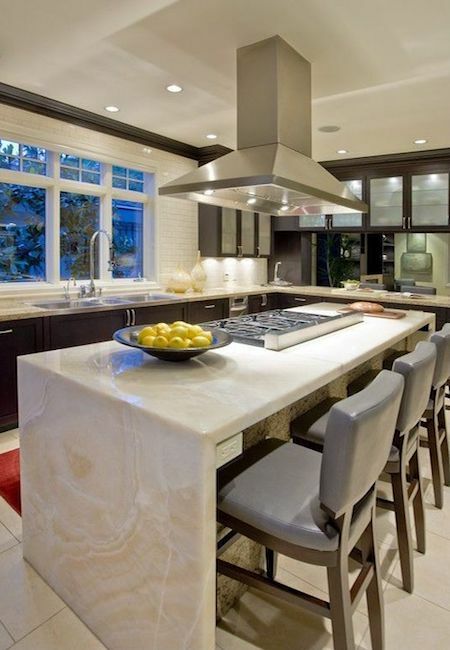 Marble, granite, quartz, and travertine are all favorites for waterfall countertops. 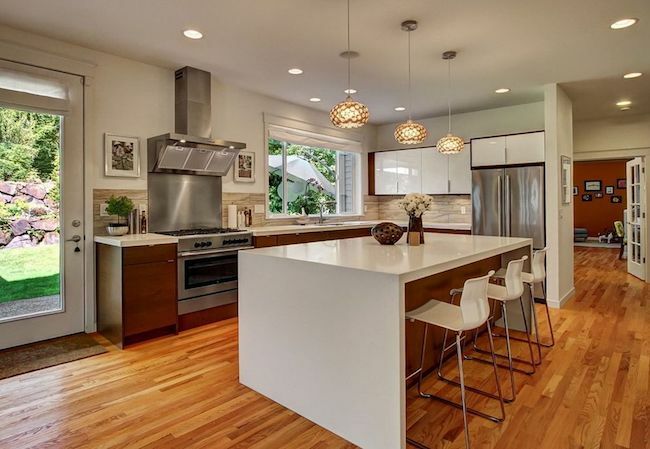 Concrete and wood, however, have entered the waterfall market, and unlike stone, countertops made of these materials are DIY-friendly (see below for details). Stone slabs range from $75 to $120 per square foot for marble, granite, or quartz, and installation can add another $60 to $100 per square foot. What’s more, waterfall countertops also involve an additional fabricating charge. To create the continuous visual flow from the horizontal top to the vertical drop, the fabricator uses a computer numerical control laser cutter (CNC) to precisely miter the edges so they fit together with virtually no visible seam. This process can add anywhere from $1,000 to $2,000 to the total price. If you install a traditional (top-only) stone countertop on a 3-ft. by 5-ft. island, at a stone cost of $75 per sq. ft., materials would cost $1,125. With an additional $60 per sq. ft. for installation, the countertop would set you back another $900, putting your total cost at just over $2,000. For a waterfall countertop, plan on an additional stone charge of $1,350 for both sides (each one would be 3 ft. by 3 ft.), bringing the cost of stone alone to $2,475. Because you’re adding an additional 18 sq. ft. for the sides, the cost for installation would increase by $1,080 at least—and, since the fabricator must miter two waterfall edges, you could easily pay an additional $1,200 for fabricating the seams. The final price tag? Ballpark $5,655. There’s no rule dictating that a waterfall countertop must be fashioned of stone, by a pro. Creative DIYers can build dramatic versions from concrete, wood, and other countertop materials. Concrete, formed and poured in place with a wet-set concrete mix, would run about $250 in material costs for a 3-ft. by 5-ft. island. Woodworkers can source a butcher-block countertop for the same size island for between $150 to $300, depending on the type of wood. And of course, by doing the work yourself, you’d save a lot more. • If they are insured. As with any home improvement project, you should get at least three bids from stone fabricators. In addition to reviewing a gallery of photos from previous jobs, ask for references from one or two of their recent customers and contact them to gauge their satisfaction. A reputable fabricator will use the same stone of the same thickness for all sides of the waterfall. Also, most reputable stone fabricators will send a rep out to take the measurements of your space. Taking your own measurements is risky because if they’re even slightly off, you could end up paying for the mistake. It’s better to do a little footwork at the beginning to ensure that you get the waterfall countertop of your dreams.